This sermon was preached on Sunday, October 21st, 2018, and was given to explain to my parishioners why a break in communion has happened between the Russian Orthodox Church and the Ecumenical Patriarchate. It will not be posted on Ancient Faith Radio because they do not want to be perceived as taking a side in this dispute. History is not just something that we read about in textbooks, but it’s something that we are living in. It’s just that we don’t realize it, because we don’t often see huge events happen. But in terms of the history of the Church, we may be in the middle of a very big shift. I hope that in retrospect we look back at this as just a little blip on the radar screen, because the problem is solved very quickly. But as most of you probably know, the Ecumenical Patriarch, Bartholomew, has announced that he’s going to establish an autocephalous church in the Ukraine and he lifted anathemas against schismatic bishops, restored them to their ranks from which they were deposed… and he has absolutely no authority to do that under the canons of the Church. Now, one bit of solace from history I think that we can take, is that these kinds of things are not new to the Church. We’ve had controversies, we’ve had heresies, we’ve had schisms in the history of the Church, and as long as the Church exists in this fallen world, and as long as it’s inhabited by sinners who live in that fallen world, there are going to be people who will cause such divisions in the Church, and the Church has weathered many storms a lot worse than this one is likely to be. We just yesterday celebrated the twentieth anniversary of the founding of our parish, and I would much rather be talking to you about where we’ve been as a parish, and where we are going, to mark that great event. But instead I feel like I have to talk about this, because I know many of you have had questions about it, and I want you to understand that when our bishops announced that we will no longer be in communion with the Ecumenical Patriarch until this matter is resolved, they did not take this matter lightly. We have in our parish many people who are from the Ukraine, and I know from talking to you about the politics of the Ukraine that not all of you agree. I don’t know if you’ve talked among yourselves and figured that out, but I certainly have figured it out from talking to you. There are people on various points of the spectrum in terms of how they view what has happened in the Ukraine, particularly in the last several years. But politics is one thing and ecclesiology is another. We’re all entitled to our own political opinions, but we’re not entitled to our own ecclesiology. There’s only one Orthodox ecclesiology. We have a canonical tradition where there is church order that we have to go by. The Russian Church has actually, despite all the accusations that it’s taken political positions in the Ukraine, has tried to refrain from taking any kind of political positions. Some people try to say that Ukraine is a cash cow for the Russian Church. Not one penny of the money that is raised in Ukraine goes to the Church in Russia; it’s just absolutely not true. 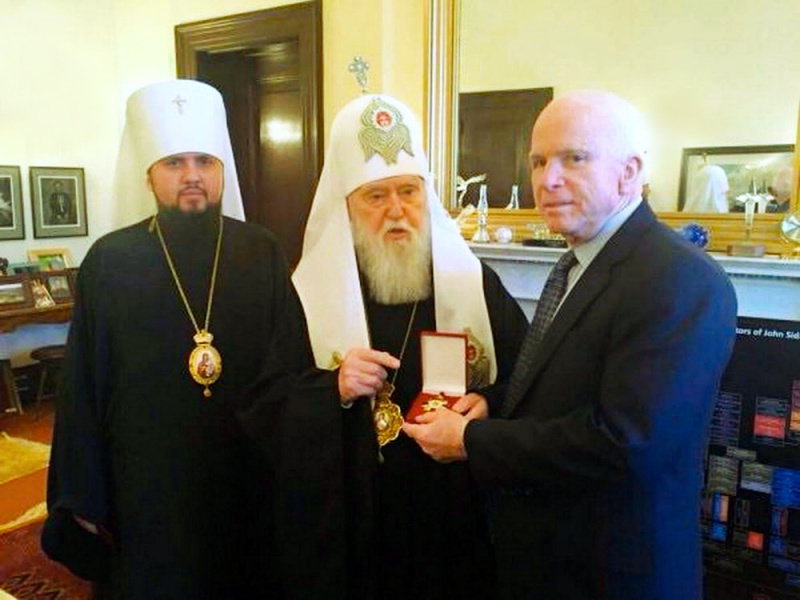 But Ukraine is not just a part of the Russian Church, Ukraine is the heart of the Russian Church. Ukraine is where the Russian Church began. And I can tell you that the Russian Church Abroad, just to give you an example, is not just a bunch of "Great Russians," to use a phrase, for lack of a better term… it’s not just a bunch of people from the Russian Federation or from backgrounds that connect there, that are picking on poor Ukrainians. Our Church.. the very first primate we had, was Metropolitan Anthony Khrapovitsky, who had been the Metropolitan of Kiev. Holy Trinity monastery was founded by monks who came from the Pochaev Lavra. Our own bishop is descended from Don Cossacks, and our current metropolitan is a Ukrainian. I’ve not bothered asking about which bishop has a Ukrainian background, but over the years I’ve learned that many of our bishops have Ukrainian backgrounds that I just assumed were Russians. And, of course, Ukraine is a very diverse country. There are people who speak Russian and really consider themselves Russians, and then there are people who speak Ukrainian and consider themselves Ukrainian. And that’s all fine, and in the Church we can have these kinds of differences. And one other thing that I would say is the day may come when the Church of Ukraine becomes an Autocephalous Church when it’s done the right way, and that may very well be what is God’s will ultimately for the Ukrainian Church. I can’t say; that’s above my pay grade. But it can’t happen this way. This is not how things happen in the Church with any kind of good order. "We desire to make known to Your Love, as your brother, that our Holy and Great Church of Christ fully recognizes your Holy Church of Russia has the exclusive jurisdiction in the matter and accepts the Synodical decisions made with respect to [Philaret]" [Letter of His All-Holiness Ecumenical Patriarch Bartholomew to His Holiness Patriarch Alexei II of Moscow and All Russia, August 26, 1992]. "Your All-Holiness, in no way does the desire and intent to offend or to grieve you at all come into our mind, not even indeed briefly. However, we are obliged to remind you both of your promise which was given in Chambesy, Geneva, in the presence of the primates of the Orthodox Churches, in the presence consequently also of our own mediocrity, that you would not intervene in the affairs of the Church of Ukraine" [August 2018 Letter from Serbian Patrairch Irinej to Ecumenical Patriarch Batholomew]. And this happened in 2016, at a meeting of all the heads of all the Autocephalous Churches. "Meanwhile, earlier, during the Synaxis of the Local Orthodox Churches in Chambésy in January 2016, Patriarch Bartholomew publicly called Metropolitan Onufry the only canonical Primate of the Orthodox Church in Ukraine. On the same occasion the Primate of the Church of Constantinople gave a promise that neither during the Council in Crete nor afterwards he would make any attempts to legalize the schism or to grant autocephaly to anybody on a unilateral basis" [Statement of the Holy Synod of the Russian Orthodox Church Concerning the Uncanonical Intervention of the Patriarchate of Constantinople in the Canonical Territory of the Russian Orthodox Church, September 14, 2018]. Even if the Ecumenical Patriarch himself sincerely believed that he had a legitimate claim on Ukraine – which obviously from his past statements we know is not the case… but even if he did, the way he’s dealing with it is not the way to do it. Even if he thought, for example, that the Russian Church was just mismanaging the situation in Ukraine, and that the people in the schismatic, so-called "Autocephalous Church of Ukraine" had some legitimate grievance that needed to be aired, the canonical way for him to deal with it would be to call for a Pan-Orthodox Synod. And some people might say, "Well, how do we know that the Russians would show up?" Well, after he announced what he was going to do, the Russian Church called for such a Pan-Orthodox Synod, as have the heads of several other Autocephalous Churches, so clearly the Russian Church would participate in such a council. But the reason why he doesn’t call such a council is because to date not a single Autocephalous Church outside of the Ecumenical Patriarchate has expressed any support whatsoever for what he’s doing. And several of them have in fact expressed just the opposite – they’ve made it very clear that they condemn what he’s doing. Canon 16 says that if a bishop admits as a clergyman "in defiance of the deprivation prescribed against [him]" …in other words, if you take a clergyman who’s been deposed, and you accept him as a clergyman, that you’re going to be "excommunicated as a teacher of disorder" [Ibid., p. 27]. "A Bishop shall not dare to confer ordinations outside of his own boundaries, in cities and territories not subject to him. If he be proved to have done so against the wishes of those having possession of those cities or territories, let him be deposed, as well as those whom he ordained" [Ibid., p. 52]. The canons are exceedingly clear that what the Ecumenical Patriarch is doing is wrong, that he has no business doing it. So this is the reason why our bishops have said that they will no longer, until this matter is resolved, concelebrate with clergy of the Ecumenical Patriarchate. We’ve also been instructed that we are not, even as laymen, to commune in their parishes. Now if there are some extraordinary circumstances, then you’d want to talk with me about that, and we can see. Because we don’t believe that the canons are like land mines. We don’t believe that because the patriarch has violated the canons, that he is therefore already deposed, and that everyone connected with him is already outside of the Church. We don’t believe that. But what we are saying is that that’s where things are headed, if they continue down that path and there is no reconciliation, and no attempt to address the situation and correct it. Now I, and I’m sure many of you, have many friends among the clergy and the laity that are under the Ecumenical Patriarch, and it really saddens me that we have come to this point, and it’s been a very surreal feeling to be in this situation. And, up until very recently, I was the president of the Orthodox Clergy Association in Houston – that happened to just change (unrelated to this whole thing) in September, and as a consequence of this, as things stand right now, I won’t be able to participate in Clergy Association meetings or on the Sunday of Orthodoxy, if this continues to be a problem, to concelebrate with my brother clergy in the Houston area, and I’m very sad that it’s come to this point. But it’s come to this point because of the actions of people who have chosen to disregard truth, and who have chosen to disregard the canons. And there has to be order in the Church. We have canons for a reason. We don’t have a Pope, for the very simple reason that we don’t believe that Christ ever gave any person any infallibility, or any special powers, to rule the whole Church. Lord Acton famously said that power corrupts and absolute power corrupts absolutely. The Church has divisions, and it has checks and balances, much like our government (constitutionally at least) has, for a reason. That’s because as long as there are sinners we will have bishops that go astray – and even very prominent bishops. And we have to have the means to correct them, and we can’t have a bishop who doesn’t answer to anybody, who just does whatever he wants, and nobody can question it. We are not in that church. If we were going to be in that church, we would be Roman Catholics… and we’re not, because we don’t believe that that’s true. We don’t find that in church history. And so what we need to do is we need to earnestly pray that this matter will be resolved. I spoke with Vladyka Peter about this and he expressed some hopes that maybe it would be resolved in the not-too-distant future. He may know something about the situation that I don’t know, and I hope that he turns out to be correct. My own more skeptical opinion is that this may not be resolved anytime soon. But we need to pray. We need to pray for a miracle that people will repent and that unity and peace in the Church will be restored. Amen.